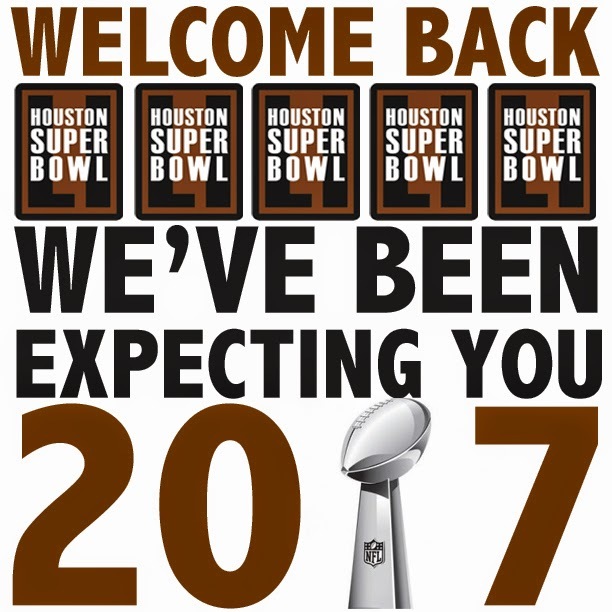 Houston is set to host the 2017 Super Bowl (Super Bowl LI), and like any other host city, plans for improvements are being made to beautify the city and provide a quick face lift for guests. Like a spray tan before prom, these improvements have historically become temporary, meant to give a host city its best image during the two weeks leading up to the Super Bowl. Houston City Council members tagged the item last week that would establish the Stadium Park Redevelopment Authority, which would promote Houston as the host city, and be responsible for raising funding to "construct, acquire, operate, maintain, and finance parks, green space, landscaping, beautification and recreational improvements to benefit the City in the support of hosting the Super Bowl and to construct, acquire, operate, maintain and finance public works and improvements in support of hosting the Super Bowl." The Authority will be formed, but not without further review from some members of Houston's City Council. (See Item 11 of the City Council agenda backup materials for the full Authority governing language.) The Authority is expected to be created by City Council this Wednesday. Many cities have touted Super Bowl hosting as providing a big boost to local economies. The NFL estimates that a city can hope to see a $300 to $400 million boost to the economy. Without a doubt host cities see increased revenue from the event, but hosting comes at a cost. Katherine Driessen of the Houston Chronicle notes that for Houston, "private investment is essential to getting ready for the Super Bowl. The city has not pledged any direct contributions, and the state is slated to cover $20 million of the roughly $50 million the Super Bowl is likely to cost." So, this leaves a $30 million gap that must be covered by someone. But by who? That is what Houston's Stadium Park Redevelopment Authority would address. Hosting an event like this brings cash to town, but at a significant cost. Dennis Coates, Department of Economics at the University of Maryland, Baltimore County, and Craig A. Depken, Department of Economics, Belk College Business, UNC Charlotte, found that "hosting the Super Bowl may well have generated an increase in the sales tax revenues collected in Houston, but that the increment to revenues was possibly smaller than the increased expenditures on security and sanitation and other public services that the event required." It was found that sales tax revenues in Houston attributed to the 2004 Super Bowl could reach as much as $5 million, which would be associated with an increase in local spending of approximately $500 million. Of that $500 million, only $5 million is coming back to the locality; just a drop in the bucket in the cost to host the event. In their footnotes, Coates and Depkin note that "one estimate put the cost of hosting the Super Bowl at $1.5 million for the city of Houston. If this estimate is accurate, the Super Bowl might have generated a small net surplus for the City of Houston. The City of Houston Controller’s Office estimated the net revenues from hosting the Super Bowl at about $900,000 (pg. 12)." Are the millions of dollars in improvements really worth it to the City of Houston and its taxpayers? The larger question in this case is, do Super Bowl visitors actually care about a city's beautification efforts? I would guess not. Would anyone really complain if cities just spruced up the area around the stadium instead of embarking on large-scale improvements? Are these wasted efforts just meant to keep an identity or image from becoming tarnished? It would be interesting to conduct a poll about host city revitalization efforts, asking visitors whether they even care about what the rest of the city looks like outside of the event venues. Transit is where cities as a whole may be the most vulnerable during a Super Bowl, but it will probably be the thing that people will care about the least in terms of their lasting experience as a Super Bowl visitor. Hosting major events can help raise interest in local or regional transit systems, but it can also expose deficiencies in transit planning, as evidenced in New York's latest Super Bowl hosting. Even the "Mass Transit Super Bowl" could not live up to its name. No matter who you're cheering for or whether you're a VIP or tailgate fan, everyone will depend on some form of transit to get to the game. Everyone will get to the game somehow. (Hopefully the NFL will not impose the ridiculous restrictions on travel as they did with New York in 2014). Houston will be tested in 2017, but the yearly testing of the transit system with the Houston Livestock Show and Rodeo had provided the city a regular opportunity to plan for the influx of transit riders. If you're a die-hard fan of either team that is playing in the Super Bowl, I would venture to guess that nothing short of seeing your team on that field will matter much. Sure, newly landscaped medians or pocket parks may be nice to look at as you walk inside the stadium, but unless you are an urbanist, these improvements will likely be lost on you as you enter the stadium and see your team on the field. Most Super Bowl preparations are temporary. Visitors can tell this. Vacant storefronts, much like those in Detroit for 2006's Super Bowl XL, were exactly that: temporary. It's a fine solution for taking an otherwise dark and dirty storefront and making it attractive. But it would be unwise for cities to spend millions of dollars on temporary fixes. Of course, no one can forget that most cities hosting the Super Bowl have a host of other humanitarian problems, like homelessness. Some cities can point to modest successes in Super Bowl preparation. The Downtown Detroit Partnership created the Next Detroit: Clean Downtown initiative to "maintain the downtown Detroit environment to the new standard set by Super Bowl XL -- and to make it inviting for workers, residents, visitors and investors." The success and programming of this program has led to the establishment of a permanent business investment zone for the same area, which is set to replace the Next Detroit: Clean Downtown initiative. But overall, the Super Bowl probably didn't provide much return on investment in Detroit. The renaissance that many predicted didn't happen. Hotels weren't built, and many buildings that were intended to be preserved and restored were instead torn down. Downtown Detroit didn't have much to offer, so much of the spending for the Super Bowl happened in the suburbs. For urban enthusiasts, authenticity is key. So, would it serve cities just as well to embrace their abandoned storefronts and minimize the number of improvements they undertake in the months leading up to the Super Bowl? There is probably enough inertia behind the Super Bowl and its related events, that a city would probably be fine without any additional beautification efforts. Simply putting yourself in a position to bid on a Super Bowl is the tough part. Without question, the economic benefits of hosting the Super Bowl are great. Millions of dollars are brought into local economies in the weeks leading up to Super Bowl Sunday, which trickles into the pockets of local workers. But, the economic impact of the Super Bowl is probably overblown after taking into account substantial substitution effect. Cities rarely reap the benefits that are promised when hosting a Super Bowl. In cities that lack a great deal of tourism, the Super Bowl can make a big difference. For example, Indianapolis hosted Super Bowl XLVI and estimated that the events surrounding the game accounted for 10% of the city's yearly tourism activity. The Super Bowl brought a great deal of revenue to the Indianapolis region, but was still very costly. Indianapolis created a long list of improvements, flanked with common items such as public art and litter abatement. Hosting the game is seen as "a sort of crowning achievement of the 40 year sports journey" that led economic and community development in Indianapolis. The city's improvement didn't happen due to a single game, but through years of investment and strategy. Aaron Renn chronicles this turnaround on his Urbanophile site. Cities and regions are also mindful of the vast media coverage that comes with hosting an event like the Super Bowl. The media spends a great deal of time in a host city, venturing into each city's neighborhoods through community service projects as well as for local interest pieces, like when David Letterman sends his intern. In 2017, in one way or another, people will be watching Houston. Houston is being wise and playing it safe regarding Super Bowl preparation, and at this point are not contributing any city funding to specific projects. For the amount of development that occurs in Houston and given the record profit of development and energy companies here in Houston, it shouldn't be a burden for the business community to assist with beautification efforts. Maybe Houston does not expect to receive much in return as a result of hosting the Super Bowl. City leaders may already understand that the economic effects of hosting the game are probably not as great as touted by the NFL. The psychological and social effects of hosting the Super Bowl probably far outweigh the economic effects that would result from large, quick urban investments. To quote Tory Gattis from his "Ultimate Houston Strategy" post from 2012, "We need that same sort of sustained, long-term strategy that goes beyond specific projects to a theme we can weave into everything we do over the decades ahead." This is already at play, as many projects, like the completion of Houston's light rail lines, Hobby Airport area improvements, and Convention Center improvements and hotels as being built not just to serve those attending the Super Bowl, but to improve Houston well beyond February, 2017. Why does it take one event to spruce up mass transit, landscaping? It shouldn't. We should be implementing these improvement projects in our cities for everyday use by our citizens. Houston actually seems to be taking that approach, slow as it may be. Houston will undoubtedly complete projects to spruce things up, most likely the result of donations or through private investment. And no matter which team you'll be cheering for in the 2017 Super Bowl, this is a good call. The bar staff at this place was professional and their drinks ensured us a fun night in the city. I can't wait to go back. Most of the negative elements of going to a more popular place are avoided at this place for NYC events; the staff was really mature and respectful. Tom Brady shows his morning routine in a new Super Bowl 2017 commercial — watch the video!